Imola's Area is a part of the province of Bologna. "Nuovo Circondario Imolese" is a Government Area in the heart of Emilia-Romagna, a meeting of the cultural traditions. 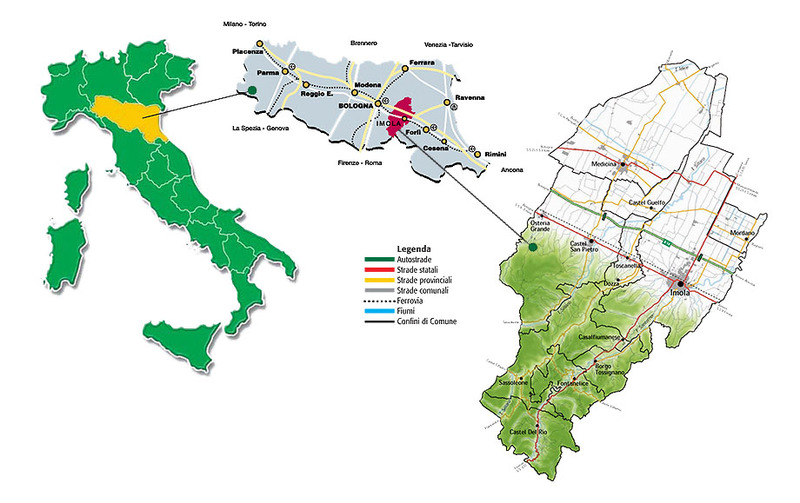 Is a special form of cooperation wanted by the municipalities of Imola, Castel San Pietro Terme and Dozza (foothill), Medicine, Castel Guelph and Mordano (plain); Casalfiumanese, Borgo Tossignano, Fontanelice and Castel del Rio (mountain). It has a land area of 787 square kilometers and population of 132,641 inhabitants at 1 January 2012. Area Imolese is easily accessible by car (A14), by train ( Bologna-Rimini), by air thanks to the nearby airports: "G. Marconi", "L. Ridolfi" Forli, and "F. Fellini "in Rimini. Every town in the region, including the hamlets and villages, is well served by means of local public transport. The area, mostly flat, lends itself to be comfortably visited by bike. The area includes 10 municipalities Imola: Borgo Tossignano, Casalfiumanese, Castel del Rio, Castel Guelfo di Bologna, Castel San Pietro Terme, Dozza, Fontanelice, Imola, Medicine, Mordano.